How to add the DLL to the GAC where no GACUtil found on Server? Recently I tried to update the third party DLL in the GAC. but when I open my server I did not find the GACUTIL on my server. When I tried for the solution this BLOG helped me. We need to run the CrmSvcUtil.exe tool from the SDK\Bin folder. Note: If we are run the tool from another folder location, we have to make sure that a copy of the Microsoft.Xrm.Sdk.dll assembly is in that same folder. One more working experience I want to share about the plug-In. I wrote a plugin in which I used another Class DLL (Third party). Now build the plugin project and registered the Plugin DLL on my CRM server with the help of registration tool. Now I did browse the CRM Organization and perform the required operation so that the plug-in code will get executed. 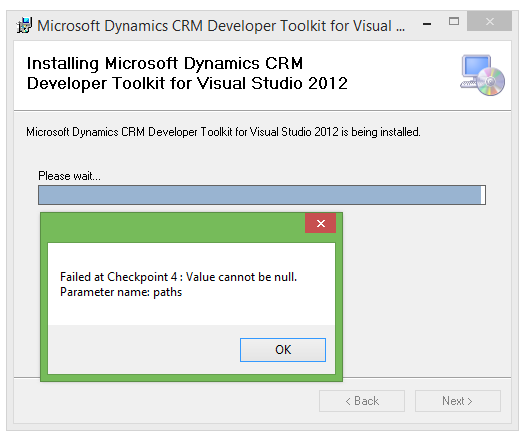 Now I got the error by saying that the third party DLL which I used was not found / loaded. To fix this issue I kept the other DLL in the CRM server GAC By using the GACUTIL registration command in the command prompt. 1) Open the command prompt and navigate to gacutil folder path. 2) execute the below statement to place the DLL in the GAC. Now once after this my application started working fine. Today I would like to share my practical experience which I came across while working with Plug-In in our environment. 2) Once the Installation is done then you can see the Remote Debugger Service Installed on the server with disabled Mode. 3) Enable and Start the Service with Manual Start Up Type (this is optional. You can use Auto Start Up Option even for service Start Up). 4) Register the Latest Plug-In DLL By using Registration Tool or By Using CRM 2013 SDK Developer Tools (Dynamics CRM 2013 Package Solution Deploy method). 5) Browse the CRM Organization from your browser so that the W3WP.exe Process will be up and running on the CRM server. 6) Open the Plug-In Development environment (IDE) and Keep the Break Point in Plug-in Execution Method. 7) Once After this, Invoke the “Attach to Process” method which you can Navigate through Debug Menu in the Development IDE. 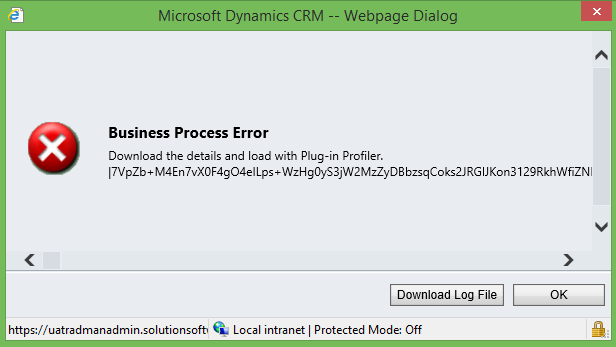 8) Attach the W3WP.exe from the CRM server Processes. 9) Perform the required operation in CRM organization so that the Plug-In code will get executed. 10) Now you can see the stopping of the code execution at your breakpoint. 1) Open the Plug-In Development environment (IDE) and Keep the Break Point in Plug-in Execution Method. Build the Plug-In DLL. 3) Register the Latest Plug-In DLL By using Registration Tool or By Using CRM 2013 SDK Developer Tools (Dynamics CRM 2013 Package Solution Deploy method). 4) Check whether the Profiler got installed or not by using the Plug-In registration tool? 5) If the Profiler was not installed then install the Profiled by using the Install Option in Plug-In registration tool. 6) Select the Specified Step in your Plugin Assembly and click on “Profile” button in Registration tool. 7) Browser the CRM Organization and perform required operation so that your Plug-in code will get executed. 8) You will get populated with an Error Message. Download the Error message and save that into a file. 9) Now come to the Plugin Registration tool back and Click on “Debug” button which you can see just beside the “Profiling” Button. 10) This will open a window (Debug Existing Plug-In) and asks for Profile path and Assembly path. Please provide the Downloaded error file path in the profile path and Plugin Assembly path in Assembly path. 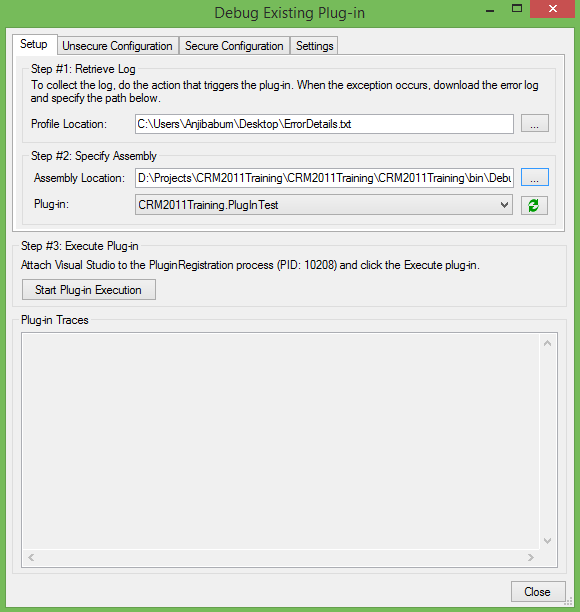 11) Once after that Navigate to Plug-In Development environment (IDE) and Attach the “Plug-In Registration exe process” by using Debug–> Attach to Processes. 13 ) Now you can see the stopping of the code execution at your breakpoint. What all databases get created when we install MSCRM? Today we are going to look for the CRM Installation side information. Today we will see the basic difference between Quick find and Advance find. Find perform a search on an attribute for which it is defined. Advanced Find perform search on the conditions and the attributes for which user customizes or runs it. Normal Find in faster as it looks for one attributes and matches with that and returns the result whereas Advanced Find searches for all the attributes and conditions while parsing through the records. Find is applicable on only active records and it finds only on 2 or 3 column which we have defined in the find view and even it returns any those column which is there in the view but advanced find is applicable to all the records and it finds all the columns and even it returns all the column and filter criteria can be on any column and most important – find filters on just one condition but advanced find filters on multiple condition at one time.. Finally the Find is faster than Advanced Find. Today we will see the CRM Plug-In Assembly Deployment storage Options. Disk: The assembly dll is placed in the \server\bin\assembly directory on each server. You have to ensure the dll is placed in the correct place on all CRM servers, so the deployment overhead is a little greater. I normally use this option in development environments as you can redeploy newer versions solely by file transfer, rather than reregistering. Also, if debugging, the assembly .pdb file needs to be placed in the same location; with this option it’s easy to ensure the dll and pdb are from the same build. GAC: The assembly is placed in the Global Assembly Cache on each CRM server, and again you will have to do this. The GAC does allow multiple versions of an assembly, but CRM doesn’t, so you don’t really gain anything by using the GAC. We never used this option. While Installing CRM 2011 we can observe that there are total 5 Groups being created in Active Directory.